Spymaster Sebastian Danvers, Lord Somerton, has spent the last decade protecting England’s shores against a French invasion. Known for his cold logic and ability to sacrifice anything for the greater good, few can outwit him and even fewer dare challenge him. Until now. After being exiled to his country estate, Sebastian is surprised when his beautiful, no-nonsense neighbor turns her seductive wiles on him. But years of intrigue have left him wondering why a respectable widow would risk scandal for a few nights in his bed. Sebastian takes his time unraveling the widow’s secrets, for he quickly realizes she might be the one sacrifice he is unwilling to make. Catherine Ashcroft spends her days doing little more than caring for her precocious seven-year-old daughter and negotiating her neighbors’ various complaints against their absentee landowner, the enigmatic Earl of Somerton. Catherine’s orderly existence soon upends and she now finds herself in a desperate bid to save her daughter’s life. Catherine succumbs to the earl’s passionate kisses and recognizes the same loneliness she has felt for years lurking in his hard, crystalline eyes. 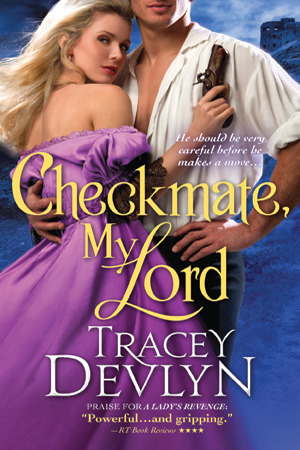 As the earl’s enemies close in, will Catherine be able to save both her beloved daughter and the handsome spy who has stolen her heart?